Don't have time to spend every night in the kitchen? Trust us we get it! And we've got just the eCookbook for all you busy cooks out there with Easy Weeknight Dinners. We've teamed up with our friends at the National Frozen & Refrigerated Foods Association, Inc. to bring you the best make ahead meals, freezer meals, and more to get you through those busy weeks. A packed schedule doesn't mean you have to miss out on a home-cooked meal! Interested in a video sneak preview of this eCookbook? Click here to check it out! We can't get enough of freezer meals; it's once a month cooking for the busy family unit! Freezer meals are especially convenient around the holidays when you're running around, trying to squeeze in shopping among visits with family and friends. Just pop one of your make ahead meals in the oven to heat it up whenever you get home, and you have a home-cooked meal ready-to-go! It just doesn't get much simpler than that. Whether you're into recipes using chicken, simple beef recipes, easy seafood recipes or some other easy dinner recipe, we've got just the recipe for you to handle those busy weeknights. Our Test Kitchen philosophy of "Quick & Easy" cooking is made with you in mind so you're spending less time in the kitchen and more time with your loved ones. So jump right in! Take a peek at some of the fantastic dinner recipes we've got in store, from easy make-from-scratch recipes to freezer meals for those extra-busy nights. 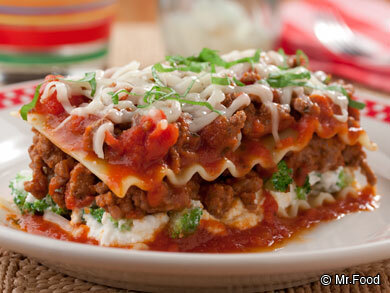 Download your free copy of Easy Weeknight Dinners: 20 Recipes for the Busy Cook today. How can you go wrong with freezer meal recipes using chicken? Reliable and classic, an easy chicken dinner will always score big points with the family. 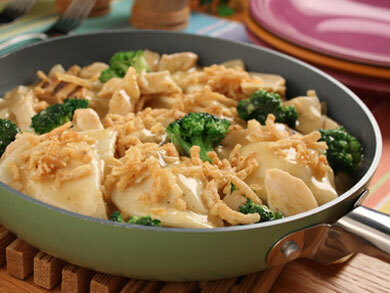 With simple-to-make recipes like our Chicken Pierogi Skillet (page 1), you really can't go wrong. The trick? We use recipe shortcuts like using various packages of frozen food for a simple-to-make easy dinner recipe done in minutes. For an easy chicken dinner the kids are going to go wild for, check out our make-ahead-meal recipe for Waffle Fry Chicken Bake (page 6). Casseroles are so easy to make and freeze for later, and we guarantee you won't taste the difference! For a portable meal on-the-go, you'll love our easy chicken dinner recipe for Mini Chicken Pot Pies (page 15). Make a whole batch of these, and keep 'em frozen, and if you're looking for a quick meal-for-one, you'll be all set! Bring on the beef! There's nothing like a hearty and simple beef recipe to fill up the family during the week. We start off by adding a bit of a cowboy flair to a classic pick-me-up with our recipe for Southwestern Meatball Soup (page 2). Perfect for rainy days, this is the ultimate feeling-dreary meal. If you're looking for a freezer meal recipe that doesn't need any sort of side, our recipe for Beefed-Up Broccoli Lasagna (page 11) has everything you need for a well-balanced diet. With meat, veggies, pasta, and much more, this make-ahead casserole really packs everything in. If you're looking for a tastier alternative to calling that same ol' pizza place on a Friday night, then you'll love our Chicago-style recipe for a Deep Dish Pizza Casserole (page 20). Add a few of your favorite ingredients to give this beef dinner recipe a personal touch. Easy weeknight dinners are our specialty. With a motto like "Quick & Easy" cooking, we've got cooking shortcuts down to a "T." Whether you're someone who abides by a "once-a-month cooking" philosophy or you're just looking for some easy make ahead meals to freeze, we've got plenty of simple dinner recipes that'll get through your hectic schedule. Plus, with our triple-tested guarantee, you can be sure that all of the recipes included in this free eCookbook are going to turn out right the very first time you make it. You can rest easy knowing that your family is going to be eating good all week long -- without having to resort to pricey restaurants or unhealthy take-out. There's no needed to feel intimidated by your kitchen when you've got these easy weeknight dinners handy! Plan out your dinner menu, Monday through Friday, with the help of the Mr. Food Test Kitchen. Whether you favor beef, chicken, pasta, shrimp, or something else, we're here to help you cook up a batch of that signature "OOH IT'S SO GOOD!!" You think seafood should be reserved for fancy restaurants and special nights out? Why do that when you can make it right at home! Never cooked with seafood before? Don't worry; we've got plenty of easy shortcuts that'll have your family believing you've done this all your life! Using frozen foods is a real time saver, especially during the week. 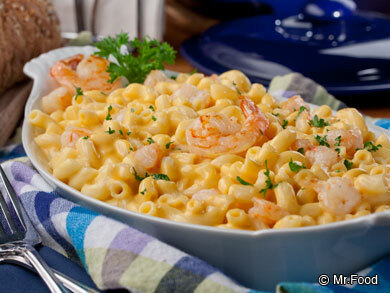 You can start off easy with a twist on a classic: Shrimp Mac 'n' Cheese (page 16). By mixing in a package of frozen shrimp, you can get a five-star meal right at home. If, like us, you're a fan of stuffed pasta, then you're going to want to check out our recipe for Crab Tortellini Salad (page 12). This easy seafood recipe makes the perfect make ahead meal for the family. And, if you're really lookin' to impress 'em, we've got a trendy recipe for Mexican Shrimp Flatbread (page 10) that'll really turn some heads. Did you think we'd forget about dessert? 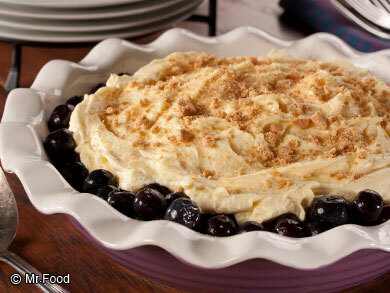 Our quick and easy dessert recipes are perfect for whipping up in a snap, even during the week. If you're feeling nostalgic for those dorm food days, then you'll love our reliably messy and delicious recipe for Wafflewiches (page 24). Load it up with all of your favorite toppings for an easy recipe for dessert that the whole family can get in on. If you're looking for something a little fruity, you'll love our recipe for Upside Down Berry Cheesecake (page 25). We've turned dessert time up on its head... and we're loving it! For an easy dessert recipe you can feel proud taking over to the neighbors', you'll need to be sure to check out our classic party-pleasin' recipe for Chocolate Chip Cheesecake (page 22). Our recommendation? Buy a little extra cookie dough, because we're sure you're going to want a bit of a snack while you're cooking! As a fan of the Mr. Food Test Kitchen's Quick & Easy cooking philosophy, I know you can see the value in this free ebook. Try out these easy weeknight dinner recipes with the free Easy Weeknight Dinners: 20 Recipes for the Busy Cook. Once you subscribe to receive our newsletter, you'll see how much fun it is to be a part of the Mr. Food Test Kitchen community! If you've ever searched for quick and easy recipes, fast dinner ideas, slow cooker recipes or anything in-between, let MrFood.com deliver triple-tested recipes straight from our Mr. Food Test Kitchen that are both easy to make and delicious to eat. Check out this free eBook and the MrFood.com site to draw tons of inspiration for your next holiday or meal! OMGoodness! Believe it or not I've checked out and downloaded every recipe eBook I could find. I lost count after 20. I've never seen another book like this. You need just one more eBook and the set will be complete...Electric Pressure Cookers. Diabetic eBook recipes would be wonderful as well. o) Thank you so very much. Very good & enjoy the delicious recipes I see as I overlook .i am a diabetic & try & keep it under control.so please help me with some good recipes& tips. They all look luscious to me - cannot wait to try some of these recipes! What happened to Mr. Food? Wow i am so amazed at the collection of recipes. This helps me out so much since I now have to cook more chicken and fish for my husband. Wow I think you just became my best friend! What a great collection of recipes. I always use shortcuts from the freezer case so this book is right up my alley.